I don't really have one either, I think the important thing is to find a good rhythm, and then try to stick to that as much as possible, and only burst when it really is needed. Basically what I try to do for myself is to at least try to keep up with kind of a steady rhythm of typing instead of being all over the place, so mostly I burst through words that I know, and when I come to words that I can't burst I try to keep it coming as steady as possible, if that makes any sense at all. Yeah, I know your pain, what I've found to be the biggest problem with error correction is that it comes with so much thinking added to it, how much do I need to delete, where do I have to continue on the word, and so on. From what I've heard from better typists than me it's mostly better to just ctrl+backspace the whole word and start writing it again, since that leads you to have to think less, and then regain more than what you lose from having to retype the whole thing, it takes a lot of thinking out of the process, I have just never managed to get into that habit. Wow didn't realize that I started my Colemak Journey on June 2nd of last year. More than a year with Colemak and I must say that I have enjoyed it very much. I am a regular 80+wpm typer still trying to improve my accuracy and speed. 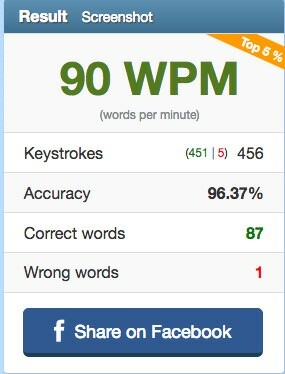 More recently have been trying to up my speed to about 90wpm, time will tell how much I succeed in that endeavor. 90wpm on a random test today.